Is It Normal for Goldfish to Hang Out at the Bottom of the Fishbowl? Goldfish are hardy fish, capable of thriving in water conditions that kill many other fish. They can survive in algae-filled water and muddy conditions, but they do need room to swim. Goldfish can grow to between 6 inches and 18 inches, depending on the species. Bowls are incompatible with goldfish besides the fact that they don't allow much swim space: The small space allows nitrates to build up quickly, poisoning the fish. Nevertheless, whether inhabiting a bowl or an aquarium, a goldfish hanging at the bottom of the bowl is in most cases unusual behavior. 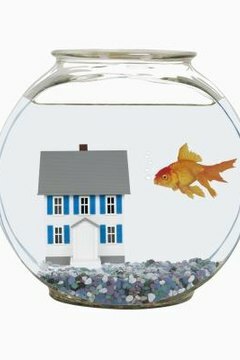 When a goldfish is stressed, he will sometimes just hang there in the water, unwilling to move. Sometimes this condition is apparent, as the fish is hanging out on the bottom of the bowl a lot. Conditions that can cause this are poor water quality, lack of air, poor nutrition and loud noises. The goldfish is sensitive not only to his own aquatic world but to the world around his own. A sick goldfish, perhaps one that is poisoned by ammonia or nitrites in the water, will be lethargic, clamping down his fins and tail and staying fairly stationary in the bowl. His colors will fade and his scales will grow dull. The sick fish won't want to eat or swim. A sick fish won't try hard to escape from a net as a healthy fish will. Goldfish are curious fish; they explore plants, shells, little aquarium toys and even substrate gravel. When confined to a bowl, they often have nothing to do but swim, and will tire of that. A bored goldfish will often just give up and do nothing without a challenge in his environment. Small toys designed for bowls, as well as shells and gravel that's too big for goldfish to swallow, are the solution. While it's true that goldfish can tolerate algae and muck to a certain degree, they will go into partial hibernation if their water becomes too cold. While it's unlikely that such conditions would occur in a bowl, the fish would react by sitting still at the bottom. Nitrates in the water stress the fish and make him sick; in a small bowl they build up quickly, causing disease. Sleeping is the only healthy circumstance for goldfish to hang out on the bottom of a bowl. When goldfish sleep, they simply hang somewhere, without moving much. The fish may still look awake, because goldfish have no eyelids to close. Sometimes the fish will sleep at the bottom of the fish bowl, but as often as not will fall asleep anywhere within the bowl. Wherever they get tired is where the sleeping fish will rest. What Does It Mean When a Gourami Is at the Bottom of the Tank? What Should a Goldfish's Water Temperature Be? Why Do Fish Move Rocks in an Aquarium? What Will Make a Goldfish Grow Faster? How Will Goldfish React With Other Fish? What Does It Mean When a Goldfish Is Trying to Stay Right Side Up? How Long Before Goldfish Hatch?